At about twenty miles off the eastern shore of Taiwan, this jungle-carpeted volcanic outcrop may be an ideal retreat from the glitz and hubbub of the country’s major urban centers, but, for better or worse, it has been pretty much ignored by international travelers. 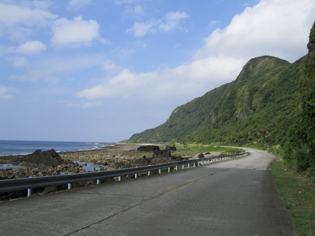 Green Island is accessible by air from the city of Taitung. Ten minutes after take-off, a twin-propeller plane will deposit you at the newly refurbished, charmingly diminutive Lu Tao airport. But it may be more fitting to approach the island by sea, in the manner of the original settlers. A shuttle ferry plying the waters between Taitung and Green Island takes only 50 minutes to cross the strait. The service is supremely reliable and only occasionally interrupted during the typhoon season. However, the seas in this part of the Pacific tend to be choppy throughout the year, so whenever you go, brace yourself for a teeter-totter ride that will, literally, take your breath away, as the cheeky little boat braves the ocean. (If prone to sea sickness, take a seat in the back. The stern is more firmly planted in the water and, as a result, sways the least. Or better yet, move all the way aft to a specially designated compartment, where you can lie down on a thick synthetic carpet.) Depending on your stamina, the ferry ride will either whet or dampen your appetite when you come ashore at Nanliao harbor and are greeted on all sides by Green Island’s seafood joints. The default option of getting around the island is by scooter. The supply of vehicles exceeds demand, and on your way out of the harbor, you’ll see dozens of rental scooters lining the road. Make sure you fill up the tank at the nearby gas-station, because you won’t encounter another one. After settling in, presumably somewhere in the vicinity of the harbor, you are ready to go. Don’t bother trying to find a detailed map: you’ll never stray too far from the ring road, which runs more or less parallel to the coastline. (There is only one more scooter-friendly road worth following. It takes you several kilometers into the jungle but happens to be a dead-end.) If you don’t make stops along the way, you can go around the island in about half an hour. But slow down on your second loop. Every other bend in the road here holds something noteworthy in store for the newcomer. Green Island’s northwestern tip is, by all appearances, its nerve center. Key social and infrastructure facilities, all within a stone’s throw away from one another, are located here: the township office, community and visitor centers, police station, library, kindergarten, elementary and middle schools. The faded buildings lining the main road are indifferent to outsiders, unremarkable and discreet in their right-angled functionality, no frills attached, nothing really to speak of. They are what they are, serving their purpose as best they can, and as though to keep them company, most of the island’s nondescript budget hotels have sprung up within walking distance, in and around Zhongliao village. On your first visit to the area, with the right amount of skill, you might even get lost in the crooked alleyways that carve up the village, but you’ll soon exhaust the route network, ending up on the ring road again. The coastal skyline is dominated here by Lu Tao airport’s stocky control tower and, further down the promontory, by the whitewashed 33-meter-tall lighthouse, no doubt the most graceful man-made structure on the island. The lighthouse was put up soon after 1937, when an American liner sank off shore after hitting the reefs in a particularly violent storm. The US government generously provided the funding. 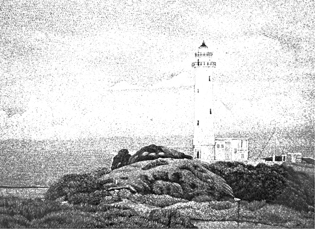 Outlying islands have often served as sites of refuge for the world-weary. Among the most notable examples are Iona in the Inner Hebrides, which for many centuries was the center of Celtic monasticism, and the Solovki archipelago in the White Sea, the northernmost citadel of Orthodox Christianity. Breaking with tradition, the 20th century tended to turn distant islands into sites of imprisonment. Of these, the Solovki are again the best-known case. After shutting down the monastery in the 1920’s, the Bolsheviks set up a prison and labor camp on the archipelago, which in effect became a test site for the later Gulag system. A similar fate befell Green Island during the martial law period of Taiwanese history, which lasted for 38 years starting from 1949, when the Kuomintang (Chinese Nationalist Party) fled to Taiwan from mainland China in the wake of their ultimate defeat by the Communists. 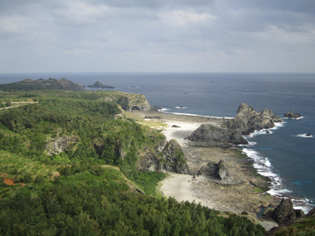 Soon after its takeover of Taiwan, the Kuomintang established a penal colony for political dissenters on the northeastern tip of Green Island. A tropical paradise island was effectively transformed into an Alcatraz-like top-security prison, euphemistically dubbed “New Life Correction Center,” where the Taiwanese suspected of Communist sympathies were sent en masse to be interrogated, tortured, and subjected to forced labor and “reeducation”. The White Terror period ended in 1987, and since then Taiwan underwent rapid democratization, which prepared the ground for the country’s subsequent spectacular economic growth. New Life Correction Center has recently been turned into Human Rights Memorial Park, dedicated to collecting, researching, and exhibiting materials relating to the darkest page of Taiwanese history. Volcanic rocks surrounding the park are still covered by Kuomintang-era slogans, aimed at “reforming” the inmates, such as “Exterminate the Communists, Restore the Country”. Most of the buildings are abandoned, some have been gutted, others have had their roofs removed. An eerie silence hangs over the area, punctuated now and again by the swell of the ocean. 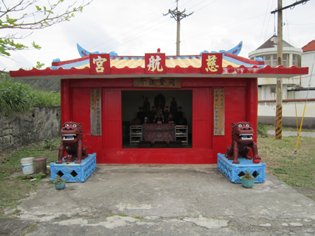 The same ring road passes by the former penal colony, and in addition to visiting the museum, you might want to check out the tiny Tzuhang Temple across the road, which was used for worship by the prison wardens and troops stationed on the island. Keep moving along the coast and in five minutes you’ll be passing by the elaborately styled entrance gate to Guanyin Cave. 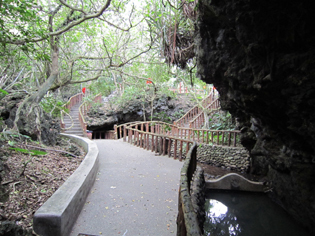 This natural limestone grotto is perhaps the most important religious site on the island. Dedicated to the goddess of mercy, it is popular with local fishermen and well taken care of. Incense burns inside day and night, and a fresh-water pool near the bottom bears reflections of overhanging tropical plants and sinuous rock formations. One of the stalagmites is wrapped in red cloth and is said to resemble the goddess Guanyin herself. Make another stop a mile down the road for a quick stroll up and down the so-called “Little Great Wall”, which is really just a 300-meter-long stone stairway fitted with wooden handrails. The stairs lead you to a cliff-top pavilion at the end of a promontory. From here you’ll get one of the best views of Green Island’s dramatic coastline. Having been the site of a political prison during the latter half of the 20th century, Green Island was spared overexploitation by the tourist industry. Offshore coral reefs, its main attraction, are remarkable for their diversity of coral and fish species. Thanks to the warm Kuroshio current flowing northward past the island, the water temperature always stays above 22° C. Most corals are stony corals, some of them mushroom-shaped. They provide shelter to some 300 species of tropical fish, as well as crustaceans, sea snakes, and sea turtles. Master-level scuba divers, capable of going 30 meters deep, travel to Green Island just to observe hammerhead sharks that frequent the adjacent waters from January to March. But rip tides and undercurrents are common, so do not attempt to snorkel or scuba dive here without first consulting the locals. If you don’t like getting wet, take a leisurely hike along one of the two mountain trails that cross the island from east to west, running more or less parallel to each other. The variety of tropical evergreens along the trails, many of them endemic, is mind-boggling: Chinese hydrangea, Lanyu fig, holly and gooseberry, Taiwan acacia, iron wood, Formosan Nato tree, to name only a few. Green Island is also a popular transit stop for countless migratory birds. If you are alone on the trail, tread softly: with good fortune, you might even catch sight of a Formosan deer. In the absence of natural predators, the deer population stands at around 2000, roughly equaling that of Green Island human residents. Finally, make sure you pay a visit to Jhaorih Hot Springs after sunset, touted locally as one of only three salt-water hot springs in the world (the other two being in Italy and Japan). Indoor and outdoor pools, with temperatures ranging from 30° to 90° C, stay open at least until midnight.